1877 card certifying the membership of John H. Richardson in the Jay Bridge Grange, Patrons of Husbandry, at Jay, Maine. 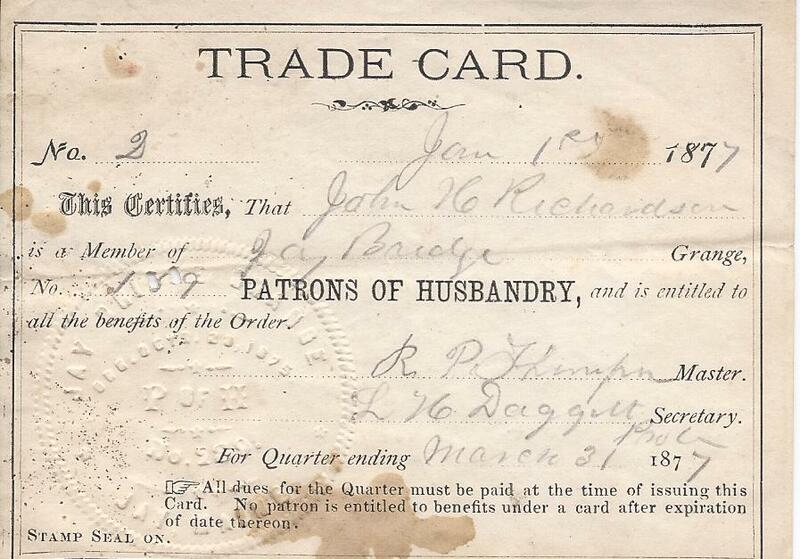 The card was signed by R. P. Thompson, Master, and L. H. Daggett, Secretary. John Hancock Richardson was born 16 December 1812 at Jay, Maine, the son of John and Eunice (Goding) Richardson. His paternal grandparents were Edward and Anne (Wilson) Richardson. His maternal grandparents were Jonathan and Ruth (Sargent) Goding. John Hancock Richardson married Jane Todd Noyes, daughter of Enoch and Hannah (Graham) Noyes. She was born about 1817 in Maine. Her paternal grandparents were Nathaniel and Mary (Tenney) Noyes. Her maternal grandparents were John and Hannah (Sprague) Graham. John and Jane lived at Jay, Maine, and raised a daughter Mary. The Master of Jay Bridge Grange, R. P. Thompson, was likely Rodolphus P. Thompson, son of Galen and Fanny (Marble) Thompson. He was born 29 September 1825 at Jay, Maine. His paternal grandparents were Lt. William and Deborah (Sturdevant) Tomson. His maternal grandparents were John and Lucretia (Richardson) Marble. Rodolphus P. Thompson married Abbie Wadsworth, born 28 October 1836 at East Livermore, Maine, daughter of Christopher Wadsworth. I found conflicting records for her mother, either Huldah Additon or someone with the surname Locke [?]. Rodolphus and Abbie raised a family of at least seven children at the farm in Jay. Rodolphus, like other members of his family, was a noted orchardist. He belonged to several social and fraternal organizations and gave lectures on agriculture. He was president of the Jay Mutual Fire Insurance Company. Grange secretary, L. H. Daggett, was likely Levi Hooper Daggett, a captain during the Civil War. He was born 21 February 1840 at Industry, Maine, the son of Orrin and Mary (Perkins) Daggett. His paternal grandparents were Samuel and Julia (Jones) Daggett. His maternal grandparents were Levi H. and Bethiah Perkins. In 1864 at Farmington Falls, Maine, Levi Hooper Daggett married Mary Caroline Delano, daughter of Calvin and second wife Lucretia (Richards) Delano. She was born 26 February 1839 at Livermore, Maine. Her paternal grandparents were James and Mary (Wyman) Delano. Her maternal grandparents were Samuel and Polly (Brainerd) Richards. Levi and Mary and their three children moved to Massachusetts at some point after 1880. If you have corrections, additions or insights regarding any of the above information, please leave a comment or contact me directly.